When wine production began in Australia during the early 1800's, the wines produced were rich and sweet, typical of a warm climate, and for the most part, consumed locally. 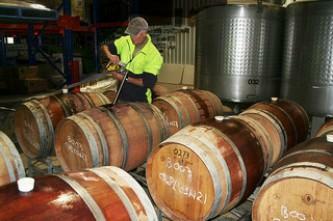 However, using modern technology, Australia now produces popular table wines that rival wines produced throughout the world. The Australian Wine Industry is the fourth largest exporter of wine around the world, with 760 million litres a year to a large international export market and contributes $5.5 billion per annum to the nation's economy. Australian wine accounts for a very large imported wine market share in South Asian countries and is the second largest imported wine in India with a market share of 16%. There is also a significant domestic market for Australian wines, with Australians consuming nearly 500 million litres of wine per year. Wine is produced in every state, with more than 60 designated wine regions totaling approximately 160,000 hectares; however Australia's wine regions are mainly in the southern, cooler parts of the country, with vineyards located in South Australia, New South Wales, Victoria, and Western Australia. The wine regions in each of these states produce different wine varieties and styles that take advantage of the particular Terroir such as: climatic differences, topography and soil types. The major varieties are predominantly Shiraz, Cabernet Sauvignon, Chardonnay, Merlot, Semillon, Pinot Noir, Riesling, and Sauvignon Blanc. Wines are often labeled with the name of their grape variety, which must constitute at least 85 percent of the wine. The wine industry is a significant contributor to the Australian economy through production, employment, export and tourism.